The other day I got out my batik scrap box and cut a bunch of 2.5 inch squares. I mean a bunch. Yesterday I paired them up and started chain piecing. Last night, while watching television, I cut and counted. Wow! There are 366 little pairs. I did not even stop for lunch. They will become part of my next project, a sixteen patch - all scraps. I love that kind of mindless sewing. therapeutic!!! Well, there is an easier way (20" x 2 1/2"). Take (20" x 2 1/2") of red fabric, (20" x 2 1/2") of blue fabric, (20" x 2 1/2")of green fabric, (20" x 2 1/2") yellow fabric, (20" x 2 1/2"), pink fabric (20" x 2 1/2")" and then sew side by side and you will end of with a block and then cut the strips of by 2 1/2" and you will end up with 8 strips with all the colors in this bunch and then next another bunch (rather than sewing them all 2 1/2" one by one). Just a suggestion. Sorry, but these are all scraps, and many are just about 6 inches or so. I find it more satisfying (and more accurate) doing them as individal squares. You inspire me to start cutting my scraps. 2 1/2" is the smallest I'll consider. A sewing fool? I have housework to do, a slipcover to make and a dog to walk, but my son's quilt is so close to having all the rows built that I can't stop. Good Job! I use my 2.5 batik squares in placemats. Scrappy, colorful and easy to do. I pillowcase them so I don't have to add binding and great practice quilting pieces. I may end up sewing them each as I have some and will probably end up with more. Been working with scraps for a year or more. Kind of a stress-relief exercise, and you have something to show off in the end. I keep boxes of 2" and 2.5" squares for just these times - when I want to sew but not think too much. I also keep triangles and make HSTs once in a while. I can always cut them to size when I want to use them. Boston! Good on YOU! I have a stack of 6 1/2" x 2 1/2" logs from scraps and odd 2 1/2" WOF strips. After charity bee this morning, the rest of my day will follow your very good example. You inspire me! Wow! Wonderful! I've been cutting squares non-stop for the past 2 weeks to get some control of stash.... but can't see even a dent in the piles. I'll be at it again today. It must be so nice to see progress. Sigh, sigh! I like to do mindless sewing sometimes! I have a small gift bag full of sewn together 2" squares. 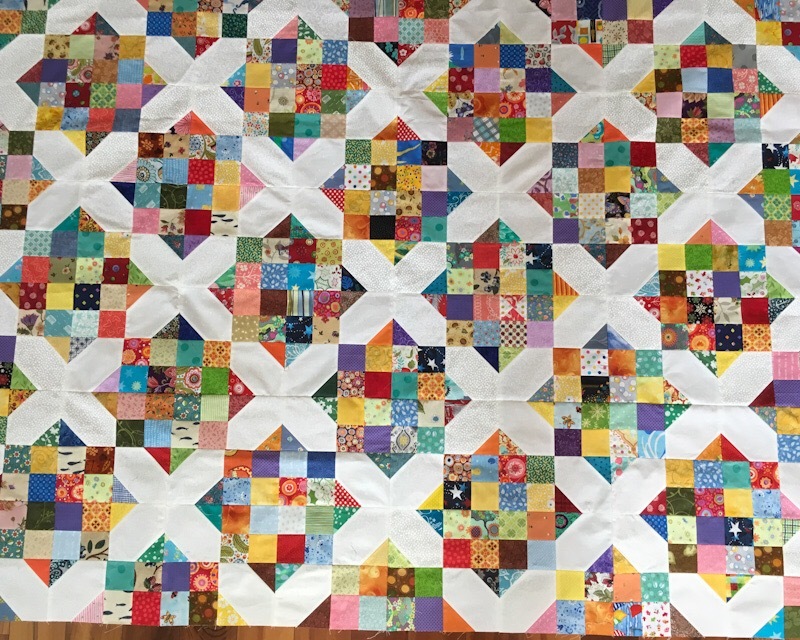 will make another quilt someday! this is my second Arkansas Roads quilt in progress. I take scraps, approx. 2" squares, right sides together, put them under my sewing foot and make an upside down "U" freehand. Five of the same fabric makes a flower. Back fabric doesn't have to match. Cut them out with pinking shears, turn them right side out, running stitch the bottom closed, pull tight and tie off. Put 5 together, button or pom pom in the center, add a few felt leaves. They look cute on stuffed animals, pencil, anything! No thinking, scrap busting, take along project, no cost. winner/winner! I like to do it Boston's way too. And guess what? Sometimes I take a 2-1/2 template square and trace and cut my smaller scraps because I can do that sitting not standing. It reverts back to childhood when I use to cut out hearts to make valentines. Most relaxing and I'm not really in a hurry. I do like my cutting mat and rotary cutter but sometimes I need to sit. I’m looking forward to seeing your project. I still have lots of squares left over from making watercolor quilts a long time ago. I have a shoe holder, plastic type that hangs on the back of a door, and all the pockets are filled with fabrics from deconstructing clothing. Your idea is inspiring to me too. I want to start selecting the fabrics that will go together in a quilt and cutting them into squares. I could just do all the fabrics, but I feel like I want to do controlled scrappy for this project! I can always mix all the leftovers at the end for truly scrappy! Sinceresissy I have an old wooden cutting board about 13" by 9" I believe, I put my 18" cutting mat on top while sitting on the couch with a bad foot and used my cutter and cut about 100 3 1/2" H's. (All scrappy). My foot is better but I still cut some that way if I need to. I need to try this for days my fibromyalgia doesn't let me stand at the cutting dresser! I never thought I'd have enough arm strength to do it sitting, but with my new Martelli Ergo cutters I bet I could!!! Thanks for the suggestion! You are most welcome wildyard. You know what they say "necessity is the mother of invention". If you gotta quilt you gotta find a way. Boston, I can't wait to see it!!!!!!!! I don't usually save scraps but I have some right now from a couple of other projects. I should give that a whirl.